What is commonly called the bailout as in the article above was in fact an epic stitch up. Our total government debt was about €47 billion in 2007, the second lowest in the Eurozone standing at around 25% of GDP and we were running a budget surplus in the 5 previous years. We have moved from this position to owing the monstrous sum of €215 billion. The main reason for this is that the true cost of the bank bailout is over €110 billion and most of it has been added to the national debt. The National Pension Reserve Fund and general exchequer fund were raided for €17.5 billion and transferred to the European Financial Stability Facility & Mechanism (EFSF&M) funds. The EU then generously allowed us to borrow €67.5 billion from the EFSF&M which we are paying back with interest. 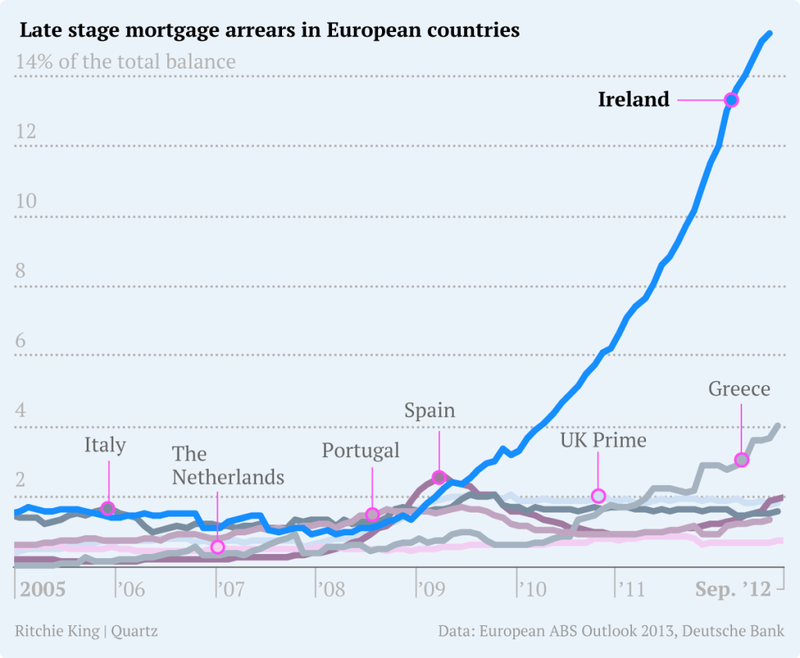 €64 billion of this has been used directly cover private and illegitimate banking debt. In this way the EU gets to have the Eurozone banking system stabilized at the expense of the Irish people and we get to pay for the privilege via the interest we pay on the debt. This does not include the €32 billion also borrowed that we have pumped into NAMA to indirectly prop up the banks by taking the bad commercial property loans off their books. 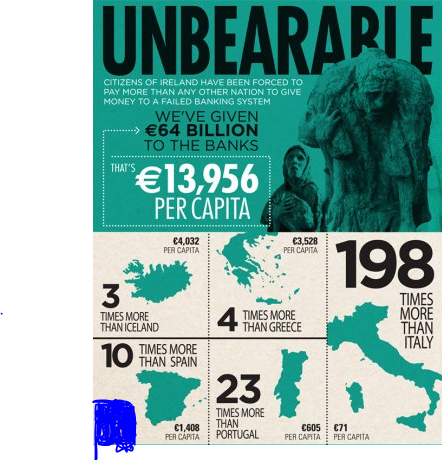 Adding the 3 figures together (17.5 + 64 +32) gives a total cost of around €113 billion and counting for the bank bailout so far. Most of this money has been borrowed and the interest payments make up a major component of our current annual budget deficits. It should be also be understood that most countries run a budget deficit most of the time and it makes perfect macro economic sense to do so. It’s really only the Eurozone countries that are required to borrow their own currency in the market at an interest rate determined by the market. Fiat currency issuing nations like the U.S and U.K do not need to obtain dollars and sterling from the bond markets to finance a budget deficit or indeed to cover private banking debt in the domestic currency. When they do choose to issue government bonds the primary objective is to implement monetary policy (e.g. drive their chosen base interest rate to target) not as a necessity to raise revenue. In addition, when those countries do ‘borrow’ in the market, they effectively decide what the yield/interest will be unlike the Eurozone nations subject to the tender mercy of the speculators. In contrast, the Euro single currency was deliberately designed to allow speculative financial capitalism to profit massively from member state sovereign debt as monetary policy is now in the hands of the ECB who impose destructive neoliberal economics on the citizens with the assistance of member state puppet governments including our own FG/Labour quislings and FF before them. The Austerity program imposed by the Troika and 2 successive governments achieved exactly what it was designed to do. That is to slash the social support structures like Health and Education and drive down the wages, working conditions and living standards of ordinary people to pay for the economic crisis caused by the capitalist elite. Privatization of our national infrastructure like the water network will follow soon as per the old IMF playbook. To justify austerity, they peddle the economic fairy tale that nations need to ‘balance the books’. This is nonsense in a macro economic context. Most countries run a budget deficit most of the time and always have done. Vicious austerity is applied to the people of Ireland, Spain, Portugal and Greece while in contrast the ECB has created over a trillion euros by pressing keys on its shiny computer in Frankfurt and made it available at extremely low interest rates to the parasite banks whose greed and stupidity triggered the economic crisis in the first place. Austerity is for the little people. In fact with the fiat floating currencies we’ve had since the 1970s there is no need whatsoever for a sovereign currency issuing government/central bank like the U.S. or Japan to ‘borrow’ at all in its own currency. They can simply create the currency at will electronically on computer keyboards. This is a major factor in why sovereign currency issuing governments actually control bond interest rates regardless of the state of their economies and with far higher debt to GDP ratios than the Eurozone nations. The government ‘debt’ market is in reality an extremely generous, risk-free, interest bearing deposit facility for the large financial institutions and ultra wealthy. Continuing this neo liberal agenda, the Eurozone was deliberately designed to allow private banks (markets) to profit to an even greater extent from member state debt and so allowed them to set the borrowing rate for Euro countries on an individual basis. There’s no mystery to US Treasury Secretary, Timothy Geithner’s intervention in the Irish bailout. Wikileaks has already revealed the reason. So, lets see – #IrishWater: a synopsis so far. 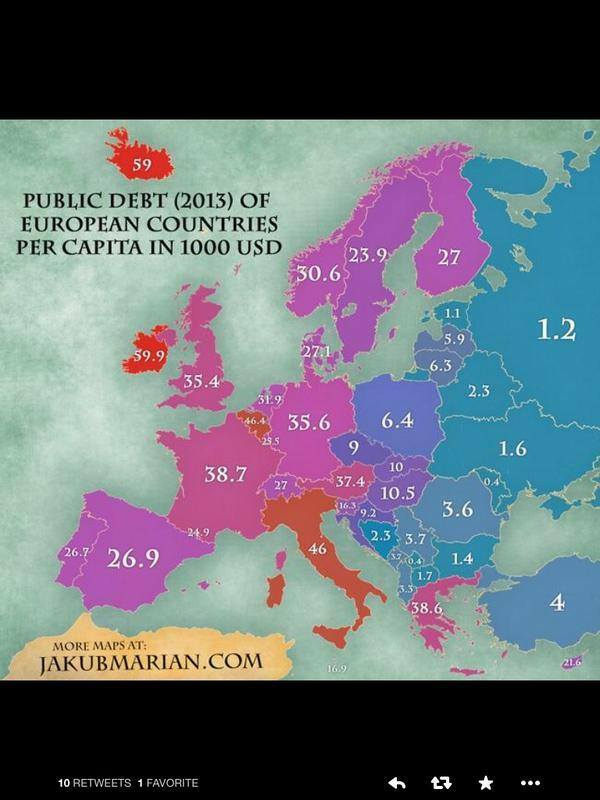 Ireland goes bankrupt and the Troika calls for more taxes. Water meters are decided upon and a plan to build Irish Water are hatched. Siemens, a company with massive resources and know-how in this area – and also with a massive installed base in the UK – offer to install the meters for free. Both Siemens and industry analysts are baffled as to why a state would go for a far more expensive solution. Denis O Brien, the man accused by a High Court Judge to have “beyond all doubt” bribed a FG government to gain control of a a state asset (Esat)- and to have subsequently made hundreds of millions by selling same – “purchases” a company called Siteserv which specialises in the installation of water meters. This is about a year before the water meter tender. Now, numerous European companies also wanted to buy Siteserv and offered way more money for the company (which then owed €100 million to Anglo Irish Bank and was completely insolvent). The Irish Government (weirdly again FG) – (or actually you, Mr(s). Irish Taxpayer) gave the company to Denis O Brien with the €100 million owed to Anglo (now state owned – i.e. by you) written off. It’s not written off for you, the taxpayer – you still pay it – it’s just that Denis doesn’t, got it? Some gamble for Denis to buy a company with €100 million written off and with no guarantee of a lucrative water meter contract. A business in an area where he has no previous experience or competence. Siteserv subsequently bids in the EU tendering process and, lo and behold, wins. The contract is for hundreds of millions of Euros. The CEO of which used to be the financial officer of an organisation which spent €100 million of Irish taxpayer’s money on the, according to the EU, illegal process to build an incinerator in Dublin. No incinerator was ever built or will ever be built but €100 million, again of your money, is gone – and John is now the CEO of Irish Water. No minutes of meetings – which spent €100 million of your money were ever recorded – the money is just gone. John then installs his homeboys and homegirls from the Poolbeg project to Irish Water – citing the abysmal salaries at Irish Water as the reason why nobody else would apply for these jobs. People who were direct beneficiaries of the illegal Poolbegl scam are now newly fledged semi-state employees. Paid for by you, the taxpayer – again. The biggest langer in this solar system is the Irish taxpayer. This is just the latest episode of the calamity that is Ireland Inc.
how the ECB actually owes Ireland €64 billion! But now Abramovich’s company Millhouse, which holds subordinated (“risky”) bonds in INBS, says it will pursue “all possible legal means” to defend its position if the government decides not to honour the full amount of the bonds when they mature. how much irish banks were in debt at the bust! Ms Curley was just 15 minutes away from Roscommon hospital when the accident occurred in November of last year. However the closure of the A&E facility there earlier in 2011 meant the ambulance had to bypass the hospital. DUE TO HSE cutbacks, ambulance stations are to close for certain time periods from September. Some truths about the irish oil.